Chapter 1: Why Ask Why? Dr. Ross introduces Improbable Planet as a necessary sequel to the book he published a few years ago, Why The Universe Is The Way It Is. In that book he argued that the various features of the universe (including its age, mass, dimensions, physical laws, etc.) demonstrated that its ultimate culmination, humanity, has a purpose. Instead of serving as evidence of humans being a purposeless accident, the universe demonstrates that there is intention behind humans' appearance. What may be seen as "imperfect" features of the universe actually provide the best world to get us to the best possible world- the New Creation. Dr. Ross begins his investigation by summarizing many of the remarkable features of our planet that are being discovered by scientists: From the time of life's origin, it has never been completely extinguished despite multiple events that should have sterilized the planet. The diversity, abundance, and complexity of life today and throughout the history of the planet have been at their maximally, environmentally supported levels immediately when the conditions permitted (adjustments were not gradualistic as proposed by evolutionary models). And this life was not just of one kind; there exists three types of life that earth has to support: purely physical, physical with minds, physical with minds and spirit. Scientists have been studying the history of our planet for millennia. As research continues, they discover numerous physical, geological, chemical, and biological events that had to take place in the just-right sequence, just-right time, and just-right levels (to name a few constraints) in order to result in the unique features above. Throughout the remaining chapters, Dr. Ross will detail these processes to demonstrate the extreme level of engineering and architecture required to create our improbable planet. Two challenges from skeptics of God being the Creator is directed at His efficiency. They come in the forms of questioning of the necessity of the enormous size of the universe and its seemingly ancient age (roughly 13.7 billion years old). Before any construction project can begin, preconstruction steps must be completed. One of these steps is to ensure the availability of the materials required by the engineering plans. The same goes for our planet. Before the construction of our planet could begin, the materials to construct it had to be present in the appropriate abundances. The more that scientists research the requirements for the origin and sustenance of advanced life, the more that it becomes quite apparent that we live in a unique location in the universe. Our planet, solar system, sun, galaxy, galaxy cluster, galaxy super cluster, and galaxy super-super cluster all have characteristics, unique among the others in the universe, that allowed for the origin of life and its continued existence. While this alone speaks strongly of design and intentionality behind advanced life on earth, astrophycists have discovered another level of preparation that our planet required before it could support life. For instance, the amount of heavy elements present on earth today (that are required for life) could not be the product of a solar system that formed in the current location of the galaxy. However, where these elements could contribute to the planet's composition, too much radiation exists for the origin of life, much less its continued existence. Coincidentally, scientists have discovered that our solar system actually formed in the area of the galaxy where it needed to to be enriched with the proper elements, then the solar system travels to the location of the galaxy where the biochemistry could be started and not be hindered. Dr. Ross argues that the fact that this two-step process is required (not to mention the multiplicity of substeps of each of those steps) indicates foresight. Just as humans prepare parts of structures off-site and transport them to the final site for the structure's inhabitants, so to was the solar system prepared off-site and transported to the final location for its inhabitants. Of course the site was not always in a state that could support the anticipated inhabitants. Once the solar system was in the perfect galacitic location for advanced life, the location needed to be rid of local hazards. The gas giants played a significant role in this step. In the early history of the solar system, numerous asteroids existed that pelted the early earth, causing the entire surface to remain in a molten state. This molten environment could not be a site for life to appear, much less continue to exist. The gravity of the gas giants served to "vacuum" the area of the dangerous asteroids. Now, there has been much debate about exactly how the solar system formed along with the specific gas giants. Model and model has been proposed, but each seemed to have a few pieces of the puzzle that they could not explain. Recently, though, the Grand Tack model has been found to resolve all the anomolies. This model proposes a delicate "dance" of the planets' orbits that allowed them to clear the area for earth and get to their current location. Interestingly enough, the model allowed for one more solar body. There has also been much debate over the formation of the moon. This solar system body provides a host of features to the earth that are necessary for advanced life. Dr. Ross explains each of these and their significance to drive home the necessity of its existence. Just as with the solar system formation, many models have been proposed without much luck, until the most recent model that posits an extremely fine-tuned collision event with another solar system body: the added problem found in the Grand Tack model. This new model explains the unexpected prediction of the Grand Tack and explains the various features of the moon. However, the probability of such a collision event is so wildly improbable that many scientists have been reluctant to accept it in the past, though they finally accepted the model since its explanatory power is so vast and its ability to resolve issues with other models (make the pieces of the puzzle fit nicely) cannot be ignored. Dr. Ross argues that the timing and contents of the asteroid bombardment, the specific formation and location of the other planets, and the precise formation of the moon, all done is the perfect sequence at the earliest time possible in the universe's history provides an amazing picture of the fine-tuning and intended purpose of our solar system for humans by our Creator. Interestingly enough, the bombardment described in Chapter 5 was itself and finely tuned event. The astroids and comets that pelted the earth brought with them elements that were required for life's origin and advanced life to continue on the planet. The types of elements and the quantities all needed to be finely-tuned to prevent too much of the necessary poisons or too little of other necessary elements. The removal of these objects could not be too soon nor too late in the solar system's history if it were to be the home of humanity. Further, the orbits of the gas giants was not enough to clear the whole band of the objects, so the orbits had to be moving. As this was being discovered astrophyscists, were hard at work adjusting models of planetary motion history to account for the current position of the gas giants. As they were successful in discovering a model that properly accounts for the gas giants' locations today, they also discovered that the new model accounted for the removal of the astroids and comets at the appropriate time in the solar system history to account for the chemical composition we find on earth. Dr. Ross argues, not only that the explanatory power of this model is superior (and most like true), but that it is another example of the engineering and purposeful preparation of our solar system by the Creator for His future creation: humans. Dr. Ross points out something else incredible about the site. Not only does the site need to be free of debris, but there are several "habitable zones" that must overlap for the site to even be compatible with the creation and existence of advanced life. These zones further reduce the possible area within the solar system for life. Six of these zones are narrow bands around the host star that if a potential life site is outside of it, then life either cannot arise or it cannot exist very long (and this is not just advanced life, but the most basic life). Six of the zones Dr. Ross describes in detail are the water habitable zone, the UV habitable zone, the photosynthetic habitable zone, the ozone habitable zone, and the tidal habitable zone. Each one of these zones independently limit where life can arise; however, since all these are required, an even more narrow band, where ALL of the zones overlap further reduces the area of the solar system that is compatible with the creation and existence of life. And to make things even more difficult (which requires even more precise fine-tuning), two more habitable zones, the rotation-rate habitable zone and the obliquity habitable zone, have effects upon the other six habitable zones. Just for a single planet to exist in all six of these habitable zones is powerful evidence that it was planned. Combine that with the timing of the precisely controlled bombardment event and the removal of the bombarding objects at just the right time, and the current position of the gas giants to continue to keep the area clear, all point to the hand of a divine Engineer who's purpose it was to create life, advanced life, and humanity. Before advanced life or humanity could be created, life, itself, had to be created, and the earth still had work to be done. In the last chapter, we saw that several habitable zones overlapped in a small window of time for earth to be able to support the origin of life. However, several studies in this field have revealed an even more shocking reality: life appeared, not at the end of the window of time (as would be expected if "false starts" took place), but at the beginning. Origin of life researchers have discovered the signatures of wide-spread life in the oldest rocks on earth. Continued study into the bombardment described above has shown that it persisted with sterilizing intensity until only ten million years before the time they time that they have detected signatures of the wide-spread life. After accounting for the cooling time for the earth's surface, the ten-million year geologic "blink of an eye" becomes even shorter. Because merely natural processes do not have the probablistic resources to account for the origin of life is such a short time, naturalists have proposed several theories, and Dr. Ross explains how they fail the test of reality. He concludes two things from the content described here: first, the fact that the entirety of the available time window for the origin of life was not necessary indicates the intentional creation of life by a Mind Who does not make mistakes (no need for multiple attempts); and second, continued rejection of the fact that the discoveries of the origin of life keep hitting the limits of nature indicate a commitment to naturalistic scientism not science. According to the latest research into planetary formation, the earth began as a water-world, empty of any dry land. In order for dry land to appear to support advanced life, a complex ecosystem of simple lifeforms, such as different bacteria, beneath the earth's ocean was necessary to transform earth's surface and atmosphere. These lifeforms helped establish the carbon, nitrogen, oxygen, and sulfur cycles that are all required for advanced life. Dr. Ross explains that the simplest life must have a genetic code of roughly 1.3 million base-pairs. This means that the first life originated in great abundance, complexity, and diversity. In order for the surface of the earth to include dry land and to cycle nutrients to the surface, along with remove dangerous greenhouse gases from the atmosphere necessary to compensate for the sun's increasing brightness, plate tectonics had to be started and remain active. Research has shown that photosynthetic bacteria (life capable of harvesting energy from sunlight) is necessary for the activity of this process. But photosynthetic life is only a fraction of the story of dry land appearing. Dr. Ross describes ten more factors necessary for plate tectonics to be sustained at the precise (and precisely changing) levels required to prepare the earth for advanced life and for the technologically advanced human race that would be its future inhabitants. Earth's first life forms were not only there to build continental landmass, but they were there to transform the atmosphere of early earth to prepare for the creation of advanced life. At the time that simple life first appeared in the oceans, the atmosphere did not contain enough oxygen for land animals to breathe. However, the abundance of photosynthetic bacteria allowed for an event called the Great Oxygenation Event. This converted the atmosphere from being hostile to being amenable to advanced life. The processes involved in the Great Oxygenation Event along with plate tectonics, and the ice age are all also responsible for the creation of petroleum deposits and the conversion of some of those deposits into the other fossil fuels necessary for the development of today's high-tech civilization. Dr. Ross explains that without the Great Oxygenation Event advanced life would not be able to survive, and without the cooperation of multiple transforming processes, the modern human technological advances would not be possible. It appears that nature not only prepared a home for the future humans but purposely stocked it full of resources to encourage a thriving and advanced human civilization. However, since nature is not purpose-driven, what we see from these processes points directly to the hand of a Designer with an explicit purpose in His fashioning of the planet's characteristics. Once all these transformative events had taken place, it seems as though the earth entered into a period of time about 1.2 billion years long that had very little going on. Scientists often refer to this time period as the "boring billion." However, Dr. Ross shows that this period of time was anything but boring. The chemical makeup of the earth's surface was being transformed by an ecosystem of abundant and diverse organisms. At the beginning of this period, the earth's surface had so many poisons in it that all possible food sources for advanced life were contaminated. Special "sulfate-reducing" bacteria converted these poisons into the metal ore deposits that we mine for technological use today. Not only was this taking place, but geophysicists have discovered active plate tectonics during this period that caused the continents to break apart and rejoin then break apart again several times. With each cycle of the pattern, the plate tectonics grew stronger which allowed nutrients necessary for advanced life to cycle. No advanced human civilization would have been possible within 200 million years of one of these cycles due to the increased seismic activity and undistributed precipitation. Dr. Ross also explains that the sizes, shapes, and locations of the subcontinents and the supercontinents all play a valuable role in reducing the rotation rate of the earth from 4-5 hours to 24 hours, which is necessary to maintain a climate amenable to advanced civilization. Dr. Ross describes several other processes necessary for advanced civilization that were taking place during this "boring billion" period of time. He concludes that since all these processes were necessary before advanced civilization could exist that the Creator was still at work on the environment He had chosen for his final creation: human beings. The temperature of the sun versus the required temperature for life has been an ongoing struggle in the field of origins. The problem that arises is that when life originated, the sun was too faint to sustain life. Dr. Ross goes through the history of attempts to address this challenge, called "the faint sun paradox." At one time, it was believed that the sun was as much as 30% less luminous than it is today. This had scientists proposing several models of various processes and conditions on earth at the time of life's origin to compensate. Dr. Ross begins with the simplest possible solutions and shows why they have been abandoned. He works his way through to the more complex solutions- ones that would require even more fine-tuning. He then examines a shift in the thinking on the amount of the luminosity difference that has found much more observational support today. While scientists are still looking for an exact figure, the current range sets between 18 and 23 percent lower luminosity. Though not as difficult to compensate for as 30 percent, this new range still will require the constant fine-tuning of at least 16+ more conditions throughout life's early history. Dr. Ross concludes the chapter by explaining five different ways in which the early life also helped to compensate for the sun's luminosity changes, which adds further to the fine-tuning of the characteristics already being investigated. He notes too that the different organisms were more efficient with transforming certain characteristics of the planet but not as efficient with other characteristics. This required the removal of these organisms and their replacement with organisms that could handle the next step in the transformation process. Interestingly enough, the next wave of organisms could not exist unless the planet had been prepared for them by the previous wave of organisms. Once again, this indicates a careful and finely-tuned step-by-step process of preparing the planet for the Creator's final creative act. The step-by-step process of progressively more complex organisms was not only necessary to transform the earth's atmosphere, it was necessary to infuse the earth's crust with the 4000+ minerals we have at our disposal today and the layer of rich topsoil that is necessary for widespread, agriculture. Digging deeper into the causes of the required extinction events (before new creation events took place), scientists have discovered that the planet had to be in the right orbital path within our galaxy to ensure that impactors with our planet would cause extinctions at the appropriate times that coincided with the sun's brightening. The numerous coincidences of these independent events powerfully suggests guidance by Someone with a plan. Moving from the extinction events to the creation events, Dr. Ross takes the reader through the various sudden appearances, or "explosions," of animals that have uncovered in the fossil record. Each event evidenced in the layers indicate that the earth was packed with its highest supported complexity of animals and the highest density of both diverse types of animals and populations of these animals from the beginning of the events. The fossil record records no period of time of gradual increase in complexity, diversity, or population. It is as if several miraculous creation events (which followed several curiously timed extinction events), with purpose and intention, are responsible for the sudden disappearances and appearances of increasingly complex animal life in the fossil record. Several sudden appearances (or "explosions") of animals appear in the fossil record. The most commonly referenced one today is the Cambrian explosion. Each explosion is evidenced in the fossil record as containing fully formed and complex animals. They display a wide diversity and maximum population levels for what the conditions on the planet could sustain at the time. Interestingly enough, the organisms from each explosion prepared the environment for the next explosion of animals. and each of these explosions ultimately prepared the earth's environment for high technology human civilizations. Dr. Ross explains that the sudden appearance, complexity, diversity, and population levels together cannot be explained by natural processes. Further, the facts that each explosion prepared the way for the next (the environment could not sustain the next wave of organisms unless the previous would did their work for the time they did) and the fact that these coincided with various extinction events that removed the no-longer-necessary organisms, all seems to point powerfully towards any naturalistic explanation being insufficient for the evidence- rather a designer being behind the whole orchestration of life's history has superior explanatory power. In the final chapter discussing the history of the planet, Dr. Ross explains that humans have appeared on the scene at the point in time where several ideal conditions also converge. For instance, the ice age that we are current in is right after a stronger one that is responsible for forming the snow and ice that is currently melting a providing irrigation for much of earth's food sources. We also exist in a period of time that is incredibly quiet regarding close super novae. Having super novae close to earth would drastically limit human population. The current diversity of plant and animal life is also necessary for large human populations with advanced culture due to their being food, clothing, and labor sources. This diversity is necessary for advanced human culture yet it is dependent upon the entire history of our planet discussed throughout the book. Dr. Ross brings the book to a close by positing an explanation for the all-but-impossible coincidences described in the preceding pages: a grand Designer, with an explicit end goal or purpose, was at work orchestrating and executing the entire project. Dr. Ross explains that just as a designer has an end goal in mind as he crafts his product, so did the Creator have a purpose in mind as he crafted the earth. He appeals to the biblical book of Revelation where the writer (the Apostle John) describes seeing great multitudes of people who had accepted Christ. All the disciplines of the hard sciences are separated by strictly naturalistic explanations. Without a designer behind the history of our planet, all the events, that have led to our existence, in large populations with advanced technology, appear to be nothing more probable that a "just so story." It is only in the Creator God of the Bible that the discoveries of the various disciplines of science find unity. While the evidence points conclusively to the truth of the history of our planet, that history cries out for a purpose: the purpose of redemption of a multitude of the Designer's image-bearers through Jesus Christ. Improbable Planet: How Earth Became Humanity's Home is an amazing read. I work with several project managers at my job, and they have shown me representations of the schedules of their various projects. These include the necessary order of numerous steps, deadlines for the steps, the goals of each step, and the final purpose. Many of the steps must be done together and within certain time periods; otherwise, the project will fail. If you have ever mapped out a project or have seen one mapped out, you may be familiar with Gantt charts and how complex they can be. As I was only a couple chapters into this book, I could not help but imagine the incredible complexity behind the project that God planned and executed perfectly to accomplish His purposes. The projects that I have seen at work do not compare to the project that was our planet. If it is reasonable to think that the smaller and less complex projects at work were the product of designers, then it is even more reasonable to understand the project that was our planet is the product of a Designer. Dr. Ross skillfully brings numerous discoveries of numerous disciplines of science together to give the big picture of the project of our planet. He then shows from the Bible what the end purpose was, and how it all comes together into a cohesive worldview that ends with Christian evangelism. He shows how God did not merely start the process at the big bang and wait for natural processes to "accidentally" complete each step. Rather God initiated each step at the earliest moment possible after the previous step was completed, and while certain steps were being completed He was working on other necessary steps. He shows how it was necessary that each step be completed within precise boundaries and deadlines that, if crossed or missed, we would not exist. Dr. Ross masterfully demonstrates God's patient yet highly active execution of His cosmic project. The argument from design in this book is awe-inspiring scientifically and theologically. The way the argument is presented makes it nearly impossible to be intellectually dismissed, especially by those even remotely involved in engineering or project management. I highly recommend that all Christians pick up a copy of this book. It will give you a new appreciation for the creation and the power, care, patience, and love of our Creator and Savior. It will also give you a tremendous tool to discuss and defend the truth of the Christian worldview from the latest discoveries in the hard sciences. I especially recommend this volume to Christian apologists interested in arguments from design. This book takes the teleological argument to the next level. It goes beyond just identifying the finely-tuned constants of the universe to show how, even within a finely-tuned universe, in order for the arrival of advanced life such as humans, the processes that formed the final site of advanced life had to be meticulously planned and guided. The argument in the book appeals directly to what is known about the necessity of a designer behind projects, and implied throughout the book is the exponentially decreasing probabilistic resources available to the naturalist to explain our existence. Scientists, every day, are discovering new features of the history of our planet that cry out for a purposeful explanation. 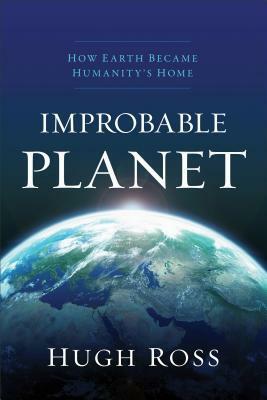 Improbable Planet needs to be in your personal library and part of your collection of tools to defend the truth that God created this universe and us for a purpose: to redeem us through the death and resurrection of Jesus Christ. *I am referring to the claim that an all-loving and all-powerful God is not compatible with the existence of natural evil. This challenge is offered by many atheists and agnostics against theism in general, and it is used by many Christians in the young-earth creationist community to claim that animal death and suffering before the Fall of Adam and Eve is not compatible with God (thus, they argue, that only young-earth creationism is compatible with Christianity). Dr. Ross addresses both attacks against his view directly in this book and its prequel (mentioned above in the review).